Stir the egg and water in a small bowl with a fork. Brush the turnovers with the egg mixture and sprinkle with the sugar. Bake the turnovers according to the package directions. To make the Lemon Crème Fraîche, beat the cream and honey in a medium bowl with an electric mixer on high speed until stiff peaks form. Beat in the sour cream and lemon juice. 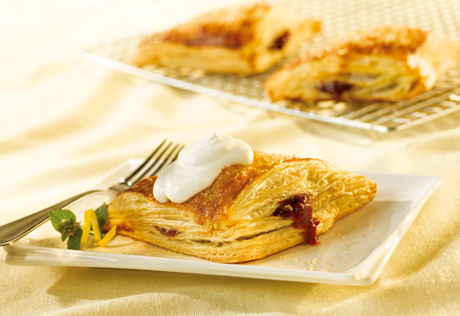 Place the turnovers onto 4 dessert plates. Top with the Lemon Crème Fraîche. Garnish with the mint, if desired.